Cute Couples Keychains - Oh So Girly! As you’ll know if you’ve read my His and Hers Love Pillowcases article, I am a romantic at heart and can’t help but awwww at cute couples stuff! So today when I saw this adorable his and hers keychain, I thought I’d share my discovery with you! Check it out! If you click on the picture it’ll take you to amazon.com for US-visitors, but it’s also available on amazon.co.uk here. 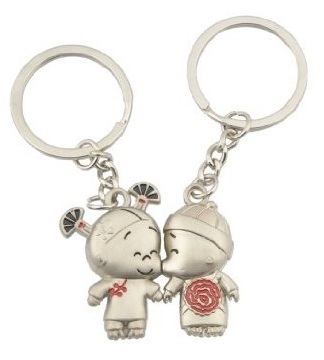 This romantic pair of keyrings also sticks together. There are magnets in the hands so that it appears the couple are holding hands!